1. Evan James: born June 18, 1939 in Belmont or Harrison County, Ohio; first married November 25, 1860 in Ohio to Melissa McCall (1843-1912); second marriage to Hannah Burch; third marriage to Ms. Stull; died April 1, 1926 (age 86) in Victor Township, Osborne County, Kansas; buried at Victor Holiness Cemetery, Natoma, Osborne County, Kansas; known children include: Lucinda James, Ursula James, Thomas James, Evalyn Lorene James, Sedate James, Wilhelmina James, William James, Clinton James, Charles Louis James, Morris James and Oliver Goldsmith James. 2. Zebulon James: born November 11, 1840 in Barnsesville, Belmont County, Ohio; married April 4, 1867 in Ada, Hardin County, Ohio to Dorothy Buckingham (1846–1920), daughter of Isaac Buckingham and Drusilla Lydick; died December 13, 1927 (age 83) in Ada, Hardin County, Ohio; buried at Woodland Cemetery, Ada, Hardin County, Ohio; known children include: Emmet E. James, Della May James, Clara James and Clyde Earl James. 3. Hannah James: born September 25, 1842 in Harrison County, Ohio; married September 20, 1870 in Marengo, Iowa to McKenzie Young; died 1923 in Cedar Rapids, Iowa; buried at Gurnsey, Iowa. 4. Mary Ann James: born circa 1846 in Ohio; never married; died after 1902; no issue. 5. Lydia Ann James: born February 4, 1848 in Ohio; married circa 1869 to Thomas Molyneux (1831–1914); died May 10, 1932 (aged 84) in What Cheer, Keokuk County, Iowa; buried at Sixteen Cemetery in Thornburg, Keokuk County, Iowa; known children include: John Israel Molyneux and Albert Zebulon Molyneux. 6. Israel B. James: born June 29, 1850 in Hardin or Logan County, Ohio; married November 29, 1870 In Poweshiek County, Iowa to Elizabeth Ann Capehart (1844–1933) daughter of Andrew Capehart and Lettitie Briggs; died June 21, 1924 (aged 73); buried at Sixteen Cemetery, Section 1, Row 3 in Thornburg, Keokuk County, Iowa; known children include: Ira James, Lowen L. James, Ellen A. James and Mary James. 7. Sidney James: born circa 1852 in Ohio; married to Rufus Sissler. 8. Susan James: born circa 1854 in Ohio; married to George Rankin; known children include: Gala May Rankin. 9. John James: born circa 1856; died in infancy. 10. Sarah James: born circa 1856; died in infancy. 11. Margaret Pheaby James: born circa 1858; died circa 1864. 12. 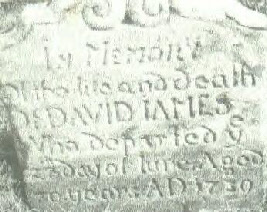 Lydia Ann James: born circa 1884; died circa 1903. Israel James (1814-1896) was the son of Samuel James, Jr. (1789-1821) of Harrison County, Virginia and Lydia Worrall (1793-1865). Find A Grave Memorial for Evan James (1939-1926), Memorial ID No. 13799868, created by Cathy Osburn, added March 31, 2006. Find A Grave Memorial for Zebulon “Zebra” James (1840-1927), Memorial ID No. 27775540, created by Ancestor Hunter, added June 23, 2008. Find A Grave Memorial for Lydia Ann (James) Molyneux (1848-1932), Memorial ID No. 92555149, created by Svandee, added June 25, 2012. Find A Grave Memorial for Israel B. James (1850-1924), Memorial ID No. 33220029, created by Zelda Capehart, added January 24, 2009. 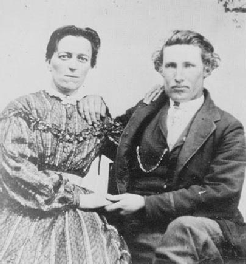 Below - Elizabeth Ann Capehart (1844–1933) and Israel B. James (1850-1924).